Did you know that resiliency is something you can actually grow? There are certain ingredients that go into planting and cultivating a thriving garden. We must tend to it, make sure it gets adequate water and sunlight, and must pull the weeds if we want it to flourish. Growing resilience within our minds and ourselves is no different. We can learn how to tend to our own inner garden and pull the weeds of negative thoughts and plant the flowers of positive feelings as we learn to focus on and ... See More install our own day-to-day positive experiences. 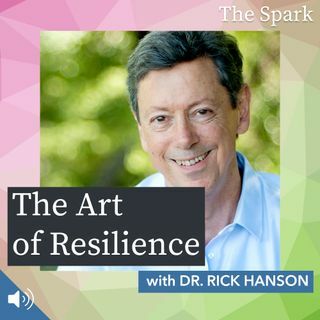 Rick Hanson, Ph.D., neuropsychologist and New York Times bestselling author of the new book, Resilient: How to Grow an Unshakable Core of Calm, Strength, and Happiness, takes us on a journey into the mind's workings and teaches us how we can tend to this inner garden and how we can cultivate the inner calm, strength, and happiness that will allow our inner and outer lives to flourish and bloom. The Spark is supported by its listeners, and by Audible.com. With over 180,000 titles to choose from, Audible.com allows you to listen to an immense library of books for every taste on your iPhone, Android, Kindle, tablet, or computer, including Resilient by our guest, Rick Hanson.